Amy Alcini is the founder and CEO of Recycling Happiness™. She is an inspirational speaker, spiritual teacher and poet. Her book Recycling Happiness: A Return to Heart is scheduled to be published by Balboa Press, a division of Hay House Publishing in 2014. The purpose of Recycling Happiness is to open, transform and gladden our hearts, by widening our circle of compassion to include all living things and all human emotions. Our greatest love, genius and wisdom already reside within us and our spiritual path is the process of removing all the barriers to love. As a former professional tennis player, Amy holds 19 USTA National Tennis Championship titles, 2 ITF/USTA World Tennis Team titles representing the USA, and holds 6 #1 end of the year U.S. National Ranking Certificates awarded to her by the USTA in the age groups of Women’s 30’s, 35’s, and 40’s. Amy now lives in Malibu, California near the beach with her puppy Rumi. Amy Alcini's debut collection of poems, expresses profound feelings of love found upon her heart as she has experienced love, loss, and life long relationships. Alcini's poems of love and the natural world not only relate to her personal experience; but highlight her understandings of universal and spiritual principles that foster all life. 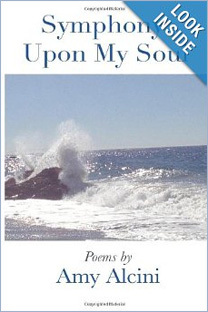 Alcini's collection of poems leads readers through a sacred lyrical experience celebrating their limitless possibilities of love. Symphony Upon My Soul bears witness to the human condition as it relates to love, tenderness and compassion.